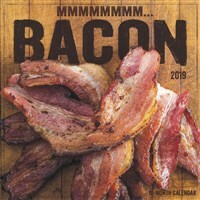 The ultimate wall calendar for the ultimate bacon fan! Make 2019 sizzle with this fun calendar filled with recipes, fun facts, trivia, tidbits and more. This makes a fun and practical gift for any bacon fan. The full color, large format calendar includes large daily grids; six bonus months of July through December 2018; moon phases; U.S. and international holidays. Printed on sturdy, high-quality stock. Our location in the Wisconsin northwoods helps keep Willow Creek Press off the publishing world's radar. Around here, we're more accustomed to landing walleyes and muskies than big books and authors - events hardly worthy of note in Publisher's Weekly. But, a few years ago we did get noticed with the release of Just Labs, a unique and colorful tribute to Labrador retrievers. The book quickly became a bestseller (now with 500,000 copies in print) and frankly startled us with its success. We were not surprised for long, however, and now an entire line of popular Willow Creek Press titles evokes the myriad joys of dog and cat ownership. Today we are known for high-quality, light-hearted books and the best Just breed calendars in the country.